There are many alternative treatments that claim petroleum jelly, oil based products, and mayonnaise treat head lice. Should you be in the unfortunate circumstance where you need to treat head lice, you'll want to find the best and most effective treatment plan and implement it immediately. Lice are highly contagious. Most common in children (primarily girls) between the ages of three and twelve, a head louse infestation can easily become a parasitic problem many parents may eventually need to treat. Easily seen by the naked eye, regular scalp screening can help you detect any head louse on your child before a full infestation begins. Lice and their eggs can be spotted on the scalp. Lice eggs (nits) resemble dandruff, but are instead a yellow, tan or beige brown dot prior to hatching. 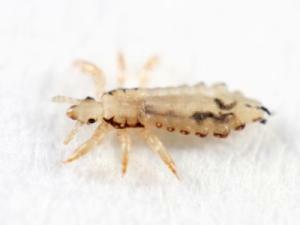 After hatching, the lice remain white or clear. Lying close to the scalp and attaching themselves to the hair shaft with small little claws, lice and nits can be picked off or combed out with special lice removal combs. If you suspect your child has head lice, do a scalp check and watch for the obvious symptoms. Often, children will itch or scratch their scalps, while on some a small red rash may develop from irritation. Children have different levels of sensitivity to lice, and often the only symptom will be the eggs themselves. 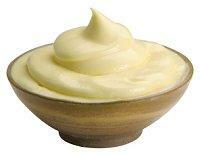 Mayonnaise may be the perfect home remedy for those seeking a safe and a believed effective form of lice treatment. While there is no scientific evidence that supports the success of home remedies, many parents have claimed great success with natural cures such as mayonnaise, petroleum jelly, and white vinegar. To treat, smother mayo all over the scalp and hair shaft. Cover with a shower cap and leave in the hair for a period of twelve hours. Many treat the scalp prior to bedtime and place the cap on the scalp. The added benefit of using mayo to treat lice is that mayo also nourishes hair, adding rich luster and conditioning dry hair. With a little luck, lice will be eliminated naturally and hair will be full of bounce and shine. To treat with petroleum jelly, repeat application in the same fashion as the mayo. A strong dish detergent may be needed to remove the oil based residue from the scalp and hair shaft. Vinegar is believed to remove the glue that allows lice to stick to the scalp, thus preventing their needed feedings and killing the parasite for good. Many have claimed great success with vinegar. If you choose to go the non-toxic, chemical free home remedy for head lice route, know that repeated treatments may be necessary to completely rid the scalp of any remaining nits or lice eggs. It's often argued that natural methods such as mayonnaise cause head lice to go into a dormant state, and that they will be back with a vengeance once their life cycle has been repeated. While treatments such as petroleum jelly, shower caps, and mayonnaise treat head lice, the best method for fighting these pesky parasites will all depend on the extent of the individual's infestation. Be advised that children under the age of two should not be treated with medicated lice products; instead seek the counsel of your pediatrician, who will most likely prescribe that each and every nit and louse be removed by hand. In these cases, mayo may be the perfect natural home remedy that you can feel good about experimenting with. If you decide against treating lice with mayonnaise, washing hair with medicated lice treatments can be effective, though the cause for repeated infestations is often incorrect usage of the treatment products. Be sure to read instructions thoroughly and consult a physician if lice remain a problem. When it comes to pesky head louse, an ounce of lice prevention is certainly worth a pound of cure. Ask your children to avoid sharing combs, brushes and hair accessories with other children. If a child has been exposed to head louse, make sure bedding, pillowcases, and blankets have been cleaned and sanitized thoroughly. Children should also avoid close head to head contact in gymnasiums, during sports, and at home. Although the inevitable lice outbreak may still occur, these prevention steps will help deter the likelihood of your child falling victim to lice. Should an outbreak occur, you may want to consider healthy alternatives like mayonnaise to cure the condition prior to seeking chemical treatments.